Happy National Poetry Month! 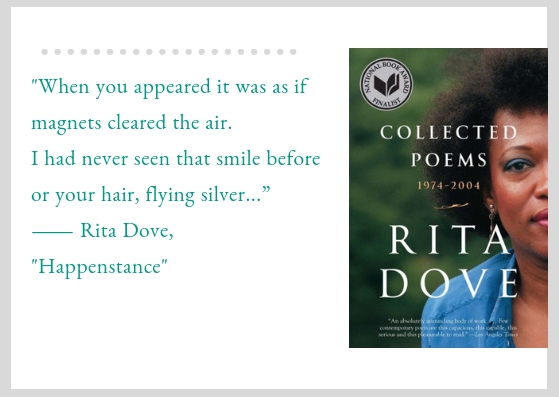 Our library staff members reflect on poetry as we pause, take new stock, and read through April. As April springs into action, we celebrate National Poetry Month in the Children’s Library with book displays and at story time. 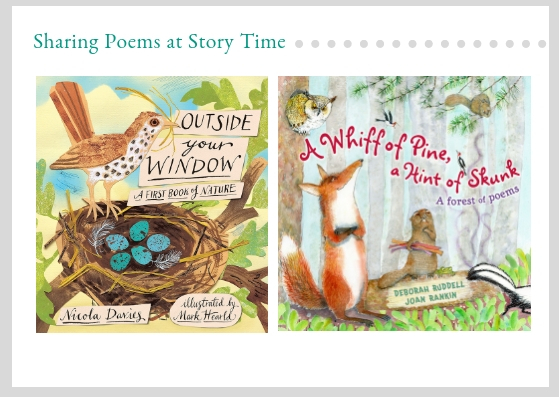 I love poetry: it’s engaging and enjoyable for groups of toddler and preschoolers alike. Many of our picture books are written in rhyme (which counts as poetry in my book!) and are used regularly at story time. This month I wanted to share how I incorporate poetry into a story time, so here’s a snapshot of what Preschool Story Time looked like this week. I hope this gives you a few ideas for using poetry and song in your own story times. Our Word of the Week was Imagine, so we began by singing “Come Under My Umbrella” while using the parachute to imagine that we were under an enormous umbrella. Bunny Day by Rick Walton is a telling time book with rhyming couplets, and we read the whole story. 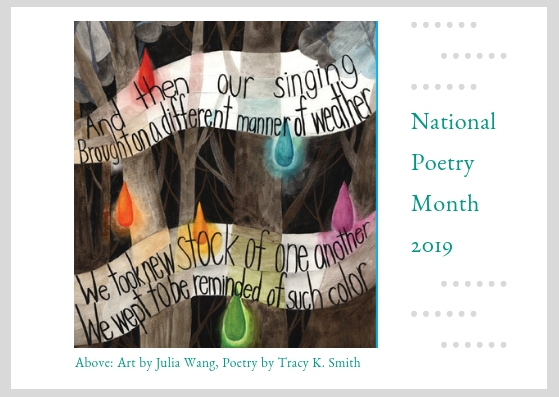 Ring of Earth by Jane Yolen has lovely seasonal poems including “Song of the Spring Peeper.” This longer poem has a refrain after every stanza, “Pe-ep. Pe-ep. Pe-ep. Pe-ep.” The children and I practiced before we began the poem so they were able to “Pe-ep” along with me. Outside Your Window: A First Book of Nature by Nicola Davies has detailed illustrations by Mark Herald, in paper-cut and collage, that fill the page and bring the poems to life. We read “Listen to the Pond” with the croaking sound of “Rrrrruurrrrp” repeated and the life cycle of the frog illustrated as well as “Nesting,” a poem that explains how birds build nests. The poems were written in free verse, so these were used to explain that not all poems rhyme. Enjoy poetry with friends young and old this month and visit us at story time anytime! Some of my favorite questions to help with at the library are searches for poetry. For example: someone is trying to thank someone they love dearly for existing. “Do you have love poems?” someone will ask (or, even better: “Do you have a love poem section?”) and I am filled with a geeky library-earnestness: “Oh yes! Yes we have love poems!” We have all kinds. The truth is we so often turn to poetry. At weddings. At funerals. When we feel raw, or distant. Elizabeth Alexander writes: “Poetry…/ is the human voice, / and are we not of interest to each other?” What does poetry say about this life—about how we lose and find ourselves, and lose and find each other? I search for poetry, too. This year I’ve been reading Poetry Rx, a sort of poetry advice column. People write in with their joys and sorrows. 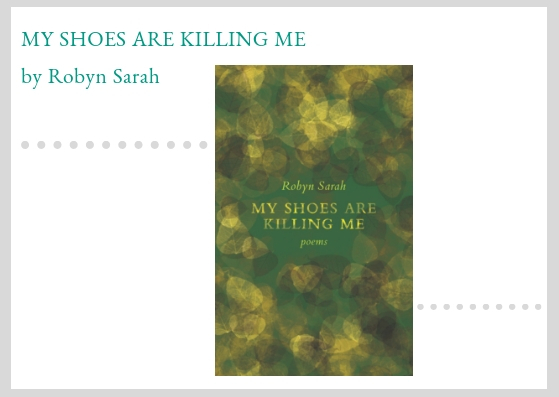 Three thoughtful poets (Sarah Kay, Kaveh Akbar, and Claire Schwartz) take turns responding with a “poetry prescription.” No one pretends any poem is a heal-all balm or remedy. It’s just that—as the people who continue to write in can attest—we’re all reaching for something. Sometimes a poem or even a line from a poem will bear us with it, to another place. And you can find Hieu Minh Nguyen. And Eileen Myles. And Solmaz Sharif. All poets prescribed by poets. And: hundreds more. Will you be electric sheep, electric ladies, will you sleep? the best mischief: to be stranded in this electricity with you. 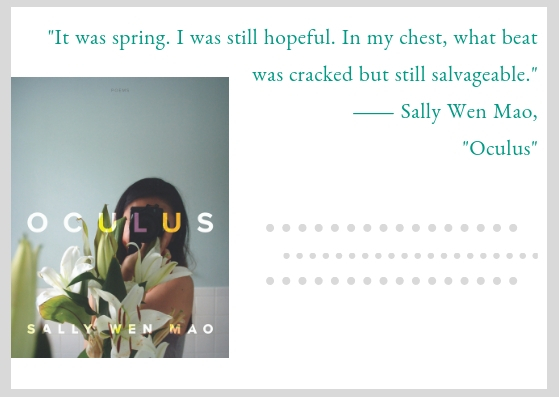 Please consider reading Oculus, a new collection of poems by Sally Wen Mao. They center around the idea of voyeurism in the age of social media, also touching on mental illness, family, love, and pop culture. She retells the history of anti-Asian racism in Hollywood while making allusions to Instagram, Pokémon, and a handful of legendary sci-fi writers. On the same page, often within the same verse, she moves effortlessly between these themes (and more); I finished the book in one sitting and am eager to read it again. Mao’s words shine: Oculus is brilliant, accessible, eclectic, provocative, and beautiful. An English teacher once said that poetry was meant to be heard, not merely read with the eyes for express delivery to the brain. I would like to add, if you can hum it, all the better. It’s not that I think a poem requires music to prop it up. At least not always. In the case of “Fly Me to the Moon” (1954) written by Bart Howard, perhaps its moon-June-spoon rhymery needs a melody. In 1965, Frank Sinatra gave it a rascally, rat pack infused smugness that makes me purse my lips and resent enjoying it. The same lightweight words coming from Joshua Radin on His Way, Our Way (2009) come across as a tentative, artlessly sweet reverie. A different song. 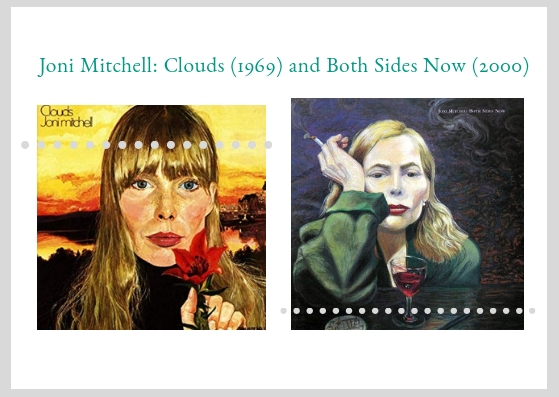 “Both Sides Now” written by Joni Mitchell changes direction between its first appearance on her 1969 album Clouds and 2000’s Both Sides Now. Both versions are drenched with heart, but Mitchell’s voice and delivery are altered with and by time, her clear, young voice seemingly aged in oak in the 30 year interval. Timbre and tempo morph. The satisfaction of hearing her interpretations deepens. A different song. “Downtown Train,” penned by Tom Waits and rubbed through the coarse sieve of his voice on Rain Dogs (1985) has been sung by countless others, but it is hard to top the writer’s own take on it. Mary Chapin Carpenter’s track on 1987’s Hometown Girl was my first exposure to it, and I love it. Rod Stewart made a couple of bucks with his recording, too. They are just the tip of the cover version iceberg, every rendition different. While I’m on about trains, consider Jennifer Kimball and Tom Kimmel’s “The Blue Train,” soulfully sung by Irish singer Maura O’Connell on Blue Is the Colour of Hope (1992). There is a Transatlantic Sessions video with O’Connell, Nanci Griffith, James Grant, Jerry Douglass & co which left me weeping when I bumped into it while preparing to write this. Wow. The wonder of it: Words. Voices. A pause, a breath taken. Connection. As ever, thanks for reading! If you’re interested in poetry readings and discussion at the library, our April line-up of events can be found here.